This Privacy Notice explains why we collect information about you, how that information may be used and how we keep it safe and confidential. Health care professionals who provide you with care are required by law to maintain records about your health and any treatment or care you have received within any NHS organisation. The information that makes up your record is also essential to help us provide you with the best possible healthcare. This practice collects and holds data for the purpose of providing healthcare services to our patients and running our organisation which includes monitoring the quality of care that we provide. In carrying out this role we may collect information about you which helps us respond to your queries, provide you with the most appropriate care, or arrange specialist services on your behalf. We may keep your information in written form and/or in digital/electronic form. The records will include basic details about you, such as your name and address. They may also contain sensitive information about your health such as outcomes of assessments. All information about you is treated confidentially and only shared on a ‘need to know’ basis. The health care professionals, who provide you with care, maintain records about your health and any treatment or medicines and care you have received previously from providers of health services, such as Buckinghamshire Healthcare NHS Trust or Frimley Health NHS Foundation Trust, your GP surgery or the Minor Injuries and Illness Unit. Any record of contact the surgery has had with you, such as past appointments, clinic visits, emergency appointments, etc. Information about allergies and adverse reactions. Information about care and treatment that you may have had with other health care providers, for example if your GP practice has referred you for treatment. Everyone working for our organisation is subject to the Common Law Duty of Confidence. Information provided in confidence will only be used for the purposes advised with consent given by the patient or authorised carer, unless there are other circumstances covered by the law. The NHS Digital Code of Practice on Confidential Information applies to all our staff and they are required to protect your information, inform you of how your information will be used, and allow you to decide if and how your information can be shared. All our staff are expected to make sure information is kept confidential and receive regular training on how to do this. NHS staff are not permitted to access information that is not relevant to the patient and the condition they are treating and our information systems are set up to prevent and track any misuse of information. We also make sure external data processors that support us are legally and contractually bound to operate. Before they begin any work they have to provide evidence in the form of a Data Security Policy, that adequate security arrangements are in place to protect patients. With your consent, providing you have capacity to give this, or with consent from your authorised representative. What else might information be used for? We wish to make sure that your child has the opportunity to have immunisations and health checks when they are due. We share information about childhood immunisations, the 6-8 week new baby check and breast-feeding status with NHS Berkshire Health Foundation Trust health visitors and school nurses, and with NHS South Central and West Commissioning Support Unit, who provide the Child Health Information Service in Berkshire on behalf of NHS England. Information may be used for clinical audit to monitor the quality of the service provided. Some of this information may be held centrally and used for statistical purposes e.g. the National Diabetes Audit. Where we do this we take strict measures to ensure that individual patients cannot be identified and the information is anonymised. Our practice is involved in the training of medical students. As part of this programme medical students will work in the practice and may be involved in your care. If staff would like a student to be present they will always ask for your permission before the start of the consultation. The treatment or care you receive will not be affected if you refuse to have a student present during your appointment. It is usual for GPs to discuss patient case histories as part of their continuing medical education or for the purpose of training GPs and/or medical students. In these situations the identity of the patient concerned will not be revealed. An ‘Individual Funding Request’ is an application made with your consent, but on your behalf by a clinician, to fund healthcare which falls outside the range of services and treatments which are routinely commissioned. These requests are considered by an Individual Funding Request Panel which considers evidence of clinical and cost effectiveness, as well as equity for the whole population. A detailed response, including the criteria considered in arriving at the decision, will be provided to the patient or carer and their clinician. Invoice validation is an important process. It involves using your NHS number to check for authorisation from the clinical commissioning group that is responsible for paying for treatment received by all Buckinghamshire residents. Section 251 of the NHS Act 2006 provides a statutory legal basis to process data for invoice validation purposes. We can also use your NHS number to check whether your care has been funded through specialist commissioning, which NHS England will pay for. The process makes sure that the organisations providing your care are paid correctly. The use of data by the UK Cabinet Office for data matching is carried out with statutory authority under Part 6 of the Local Audit and Accountability Act 2014. It does not require the consent of the individuals concerned under the Data Protection Act 1998. The Audit Commission Act 1998 defines data matching as the comparison of sets of data to determine how far they match. The purpose of data matching is to identify inconsistencies that may indicate fraud. Clinical commissioning groups support GP practices by auditing anonymised data to monitor locally commissioned services, measure prevalence and support data quality. The data does not include identifiable information and is used to support patient care and ensure providers are correctly paid for the services they provide. Clinical commissioning groups support local GP practices with prescribing queries which generally don’t require identifiable information. Clinical commissioning group pharmacists work with your practice to provide advice on medicines and prescribing queries, and review prescribing of medicines to ensure that it is safe and cost-effective. Where specialist support is required e.g. to order a drug that comes in solid form, in gas or liquid, the clinical commissioning group medicines management team will order this on behalf of the practice to support your care. Risk stratification is a process for identifying and managing patients who are most likely to need hospital or other healthcare services in the future. Risk stratification tools used in the NHS help determine a person’s risk of suffering a particular condition and enable us to focus on preventing ill health and not just the treatment of sickness. Unidentifiable, anonymised information about patients is collected from a number of NHS organisations and then analysed by software managed by NHS South, Central and West Commissioning Support Unit to create a risk score. This risk score is then given back to your GP practice who will assess future healthcare needs. This should improve care for everyone by helping practices to work more proactively by planning healthcare in advance. Patient data is securely managed throughout the whole process to ensure that identities are kept confidential. 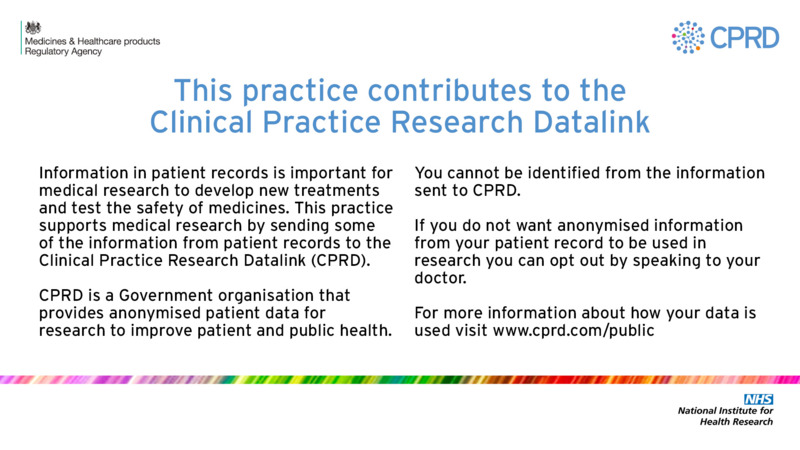 If you do not wish information about you to be included in the risk stratification programme, please let us know. We can add a code to your records that will stop your information from being used for this purpose. Please be aware that this may limit the ability of healthcare professionals to identify if you have or are at risk of developing certain serious health conditions. Sometimes your information may be requested to be used for research purposes – the practice will always seek your consent before releasing information for this purpose. The NHS in England uses a national electronic record called the Summary Care Record (SCR) to improve the safety and quality of your care. It only contains basic information from your GP record and is not the full patient record. Your SCR provides authorised healthcare staff with faster, secure access to essential information about you in an emergency or when you need unplanned care, where such information would otherwise be unavailable. The core information of the Summary Care Record comprises your allergies, adverse reactions and medications. An SCR with additional information can also include reason for medication, vaccinations, significant diagnoses / problems, significant procedures, anticipatory care information and end of life care information. Additional information can only be added to your SCR with your agreement. Please be aware that if you choose to opt-out of the Summary Care Record (SCR), NHS healthcare staff caring for you outside of this practice may not be aware of your current medications, allergies you suffer from and any bad reactions to medicines you have had, in order to treat you safely in an emergency. Your record will not be shared with the Summary Care Record (SCR) programme. Your information will continue to be shared as previously in connection with your care, by letter, email, fax or phone. If you wish to opt-out of having Summary Care Record (SCR) please return a completed opt-out form to the practice. Your patient record (My Care Record) is held securely and confidentially on this practice’s electronic system. If you require attention from a health or social care professional, such as an Emergency Department, Minor Illness and Injury Unit, 111, Out Of Hours location, or specialised local health and social care team, those treating you are better able to give appropriate care if information from your GP patient record is available to them. This information can be locally shared electronically via My Care Record. In all cases, your information is only used by authorised health and social care professionals in organisation involved in providing or supporting your direct care. Your permission will be asked before the information is accessed, other than in exceptional circumstances (e.g. emergencies) if the health care professional is unable to ask you and this is deemed to be in your best interests, the reason for access will then be logged. Records and their access are audited by nominated privacy officers, on a regular basis to ensure compliance. If you wish to opt-out of My Care Record please return a completed opt-out form to the practice. This Practice works with specialist health and social care service teams such as the diabetes and Locality Integrated Teams, to provide safe and joined up services in Buckinghamshire. The shared My Care Record provides authorised health and social care staff with access to relevant information, which helps them to make informed, timely decisions about your care and treatment and for new information to be instantly updated in your record. Access is strictly controlled by your practice. If you do not wish your data to be shared with the specialist service teams please let us know so we can code your record appropriately. We will approach the longer term management of our patient records in line with the Records Management NHS Code of Practice for Health and Social Care. This sets out the required standards of practice for managing the records that staff working within or under contract to NHS organisations in England must follow; and it is based on current legal requirements and professional best practice. If you transfer to another GP and we are asked to transfer your records we will do this to ensure your care is continued. Currently the NHS is required to keep GP records for 10 years after a patient has died. Exceptions to these rules are detailed in the code of practice. Private sector or voluntary sector providers – working to NHS contracts. We will never share your information outside of health and social care partner organisations without your explicit consent, unless there are exceptional circumstances such as when the health or safety of others is at risk, where the law requires it. Within the health partner organisations (NHS and Specialist Trusts) and in relation to the above mentioned themes – Risk Stratification, Invoice Validation, Supporting Medicines Management, Summary Care Record – we will assume you are happy to for your information to be shared unless you choose to opt-out. This means you will need to express an explicit wish not to have your information shared with the other NHS organisations; otherwise they will be automatically shared. We are required by law to report certain information to the appropriate authorities. This is only provided after formal permission has been given by a qualified health professional. There are occasions when we must pass on information, such as notification of new births, where we encounter infectious diseases which may endanger the safety of others, such as meningitis or measles (but not HIV/AIDS), and where a formal court order has been issued. Our guiding principle is that we are holding your records in strictest confidence. If you are happy for your data to be shared and used for the purposes described in this Privacy Notice then you do not need to do anything. If you do not want personal confidential information that identifies you to be shared outside your GP practice you can register a ‘Type 1 opt-out’ with your GP practice. This prevents your personal confidential information from being used except for your direct health care needs and in particular circumstances required by law, such as a public health emergency like an outbreak of a pandemic disease. If you do not want your information to be used for any purpose beyond providing your care you can choose to opt-out. If you wish to do so, please let us know so we can code your record appropriately to stop your records from being shared outside of your GP Practice. ‘type 2’ opt-out. NHS Digital collects information from a range of places where people receive care, such as hospitals and community services. The new programme provides a facility for individuals to opt-out from the use of their data for research or planning purposes. For anyone who had an existing type 2 opt-out, it will have been automatically converted to a national data opt-out from 25 May 2018 and you will receive a letter giving you more information and a leaflet explaining the new national data opt-out. The national data opt-out choice can be viewed or changed at any time by using the online service at www.nhs.uk/your-nhs-data-matters. We will respect your decision if you do not wish your information to be used for any purpose other than your care but in some circumstances as already outlined, we may still be legally required to disclose your data. Under the Data Protection Act 1998 everybody has the right to see, or have a copy; of data we hold that can identify you and to have it amended or removed should it be inaccurate. You do not need to give a reason to see your data. Under special circumstances, some information may be withheld. We may charge a reasonable fee for the administration of the request in certain instances (e.g. where a duplicate copy is requested). A ‘data controller’ determines the purposes and means of processing personal data. Any changes to this notice will be published on the practice website and in a prominent area at the practice. If you have concerns or are unhappy about any of our services, please contact the Complaints Manager at the practice. Further information about the way in which the NHS uses personal information and your rights in that respect can be found at the NHS Care Record Guarantee, information below. We have Medical students from The University of Buckingham attached to the practice for short periods. These student have not completed their initial medical training so are not qualified doctors, but being attached to our Practice gives them a good grounding in what General Practice is like and is designed to help students choose to become GPs after qualification rather than specialists in hospitals. Because they are not qualified doctors they cannot do many of the things our regular GPs can do and require a relatively high level of supervision, although they may be expected to talk to and examine patients on their own and then discuss their findings with the supervising GP. There will be a notice in Reception to alert you if you are coming for an appointment in a surgery which has a medical student in attendance: if you would rather not be seen by the student please notify Reception when you book in and the GP or Nurse you booked to see will see you without the student. Your preference will not affect the treatment you receive. If you wish to consent to a family member or a friend discussing your care with the doctors, nurses and staff, such as test results being given to your partner, or appointments being made by a friend etc then we can arrange this, with your signed consent. If you are over 18 years this consent will remain active indefinitely unless stated otherwise or you take action to rescind the consent given. If you are between 16-18 years, the consent form will only apply until the age of 18 when a new form would need to be completed. The Freedom of Information Act, gives the general right of access to all types of recorded information held by the practice. The intention of the Act is to encourage a spirit of openness and transparency in the NHS and the whole public sector. Our organisation aims to fully support this. The public have had full access rights from January 2005. This means that far more information will be routinely and freely made available. This is subject to some exemptions, which will be outlined later in this leaflet. There is a range of exemptions covering personal data, security, formulation of government policy commercial and individual confidentiality. A further absolute exemption is where information is accessible by other means or if the information has been provided in confidence. Other exemptions include information relating to commercial interests and audit functions. Requests must be in writing (email and fax acceptable) and must include the name and address for the correspondence and a clear description of the information requested.